If you are hosting an event where alcohol is not allowed, post these Alcoholic Beverages Prohibited Aluminum Signs to make sure people are aware of the rules. This quality aluminum sign is 12''x18'' and reflects when light passes over it due to it's reflective aluminum coating. This makes the signs easy to see, even when its dark. Our reflective aluminum signs will never rust and have an average lifespan of 7 years. These signs meet most State and Federal D.O.T. specifications. 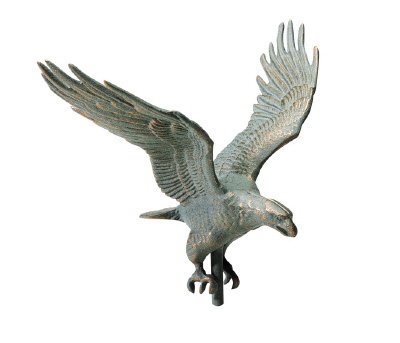 Show that you have pride in our country with this excellent eagle weathervane. Great care has been taken to make sure that this weathervane is detailed and won't rust in harsh weather conditions. It is made from rust-free aluminum and then coated with a special weather-resistant finish. It is available in either a gold-bronze , verdigris, or rust finish. You'll be the envy of the neighborhood when everyone sees this weathervane. Promote your car dealership with our Brushed-Chrome Dealership Decals. That's right, put your dealerships name on every car in your lot. People will know where to go when they see a car they like. Not only that, but the brushed-chrome decals will add a sharp, clean look to any automobile. Decals feature a classic appearance, over-laminated for extra durability. Dealer identification decals great for: Automotive and Marine Dealers, ATV and RV Dealers, New Dealerships, Used Car Dealerships and Leasing Companies. Wow~ How do I thank you enough for helping us put together our order in such short notice? We have received the signs and even have sold 1/2 of them already to our band families. They are such a huge hit! Your company provided us with a high quality item at an affordable price and we are so appreciative. We will definitely be back when we need more and make sure to recommend your services to our friends. Looking for a marine sign that says exactly what needs to be said? Look no further than our aluminum No Diving sign from SignOutfitters.com. This sign even has a reflective aluminum coating, which makes it visible at night whenever light hits it. These signs add a sense of safety by warning people of the risk of diving in an unsuitable area. These signs are ideal for pools, lakes, and other areas near water. Pennant strings can be used for a variety of promotions. Use pennants to promote your business, event, or political campaign. A pennant string is ideal for retail store and brand identification, business grand openings, real estate sales and sales promotions. Our most popular pennant string is available in over 30 color combinations. Use our checkered flag pennants at the finish line of your event. Order pennant strings in your company colors online. Thank you very much for just about perfecting our most recent sign order. It's exactly what we asked for and we're looking forward to using them and getting great responses in return from future prospects and customers. Your service is excellent as well as your timely delivery. Once these signs are used up, be assured that unless we become tired of getting too much business you'll be getting another order from us for more. I will recommend your company to any other business besides our competition. Introducing our Speed Zone Ahead Aluminum Sign from SignOutfitters. This is an excellent street sign due to it's handy reflective aluminum coating. That's right, this sign will illuminate when light hits it. That makes this sign very noticeable and easy to read, especially at night when visibility is needed the most. Since this street sign is made out of aluminum, it will never rust and has an average lifespan of 7 years. Talk about a sign that lasts! This sign meets most State and Federal D.O.T. specifications. Looking for a way to advertise wherever you park your vehicle? 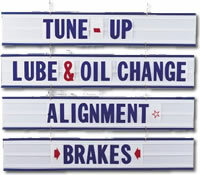 This Changeable Message Car Top Sign is perfect for those who want to advertise on the go. This product is especially handy if you live in a city that has restrictive sign codes that ban sidewalk signs. Your advertisement will certainly stick out, being as it will be on top of your car. Change up your message in minutes with this easy to use car top sign. Now you can advertise your products or events with this great hanging sign. The panels can be used together as four separate hanging signs. Change your message in only minutes with this handy sign. You will receive 165 4-inch letters, numbers, and symbols (available in black, red, or blue). It also includes a chain for hanging and suction cups for window placement. This hanging sign is designed for indoor use only. 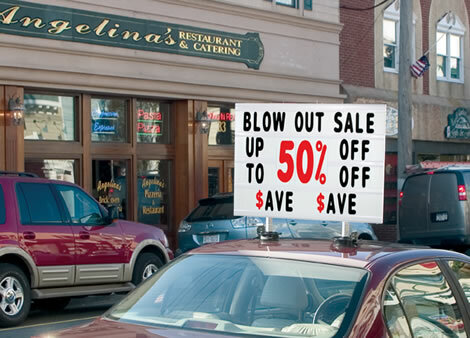 Order your 4-in-1 Hanging Sign today and begin advertising easily and effectively.